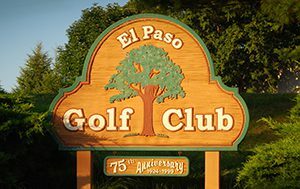 Welcome to the El Paso Golf Club! EPGC is a scenic, well maintained, challenging test of golf from any set of tees. Our course measures 5045 from the front tees, 5664 from the middle tees and 6111 from the back tees. The USGA course rating is 69.6, with a slope of 126. EPGC features many elevation changes, 40 sand traps, 1,200 trees, three lakes and a creek running throughout. Water comes into play on 13 holes. Throughout the golf season, the restaurant serves a variety of lunches daily. Breakfast is served on weekends and holidays. Dinner selections and features are available on Tuesday through Saturday nights from mid-April through late October. A full service bar complements the menu selections. EPGC has earned a four star rating from Golf Digest and the course was host to Hooter’s Tour tournaments from 1991-1997. The USGA Mid-Am Qualifying has been held at EPGC along with IHSA regionals, McLean County Seniors and other tournaments.